EYERIES lace designer and artist Fiona Harrington has won the Lace Category Prize — the Eleanor De La Branchardière Award worth €1,200 — for her piece “Deserted Cottage” at the Royal Dublin Show National Crafts Awards Competition. Fiona’s work combines Carrickmacross and Kenmare needlepoint lace techniques, using both traditional and unconventional approaches to lace. 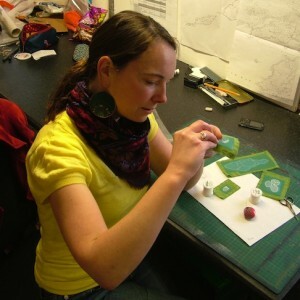 Fiona studied lacemaking at the Kenmare Lace Centre, where a strong tradition of lacemaking exists. It was introduced to the Town in 1861 by the Poor Clare nuns as a mean of creating employment and industryafter the Great Famine. Dating back almost 200 years, Carrickmacross is the oldest of Irish laces. Using sapplique and cut-away techniques, this style of lace is native to Co. Monaghan. Recognised as a “pure lace”, Kenmare needlepoint is produced using only a needle and thread — thread as fine as a human hair. The two techniques are intricate and highly complex, requiring hours of focused concentration. Fiona’s studio overlooks the Atlantic Ocean on the Beara Peninsula between the village of Eyeries and Castletownbere.